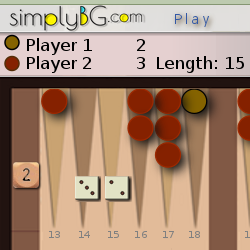 SimplyBG.com is an Internet enabled web-application that provides robust communication to multiple systems for the purpose of facilitating and managing head-to-head player experience for the game of Backgammon. This Backgammon game management software is built using only internally available features provided in all popular and modern Internet web-browsers, thus requiring no software installation and therefore reducing the complexity of deploying it or offering it to a vast number of players. At SimplyBG.com you can play single-game matches or multiple-game matches. You can also participate in our regularly organized backgammon tournaments and play against many players. See a full list of features at http://www.SimplyBg.com/features.html.